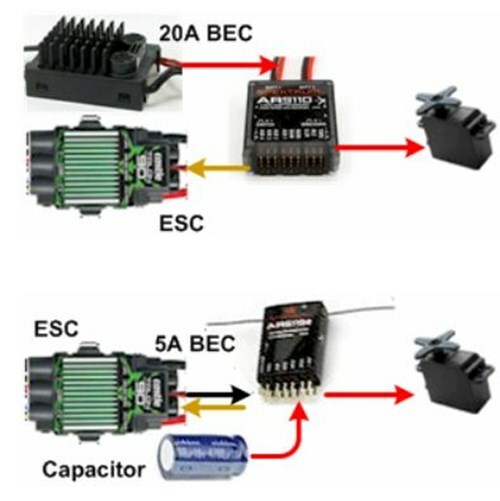 Before reading this RC receiver power supply article, it's recommended that you first read the Digital Servo Experiment article as a prerequisite. It will help you to better understand the tradeoffs to be made between capacitance and a higher amped power source. This article will help you design a safe power supply system for your radio and servos, primarily from a Battery Eliminator Circuit (BEC) perspective. What you learn here can be applied when using other sources of receiver/servo power. My Mikado 550 heli kit came with the illustrated ESC which has an embedded 5 Amp BEC. It has served me well for over a year without needing an external BEC. Notice the large 6800 uF capacitor along its side. The capacitor averages the pulsing servo load so that the 5 Amp BEC can do the job without having to resort to an external 20A BEC. I decided to switch to a Castle Creations ESC in order to enjoy its data logging and other features. My Phoenix Edge ESC features an embedded 5 Amp BEC. The two capacitors peeking out at the left are ESC input capacitors, not BEC output caps. The Castle BECs use very little capacitance and so I was immediately experiencing severe Vbar restarting problems. What if the 5 Amp embedded BEC had worked out well, except for a rarely occasional restart and crash? More about how to make sure your power system is adequate near the end of this article. External BEC or Adding Capacitors? If you have a medium sized helicopter (e.g. my Mikado 550) and plan to use an ESC with an embedded BEC, is it better to add an external 20A Castle BEC or a couple of fat capacitors? Both alternatives take up about the same amount of space. High efficiency switched mode power components are relatively small and light weight. Capacitors are bulky and may weigh a bit more. So the BEC manufacturers are faced with a design tradeoff. For a given digital servos load increasing the amoaunt of capacitance can dramatically reduce the peak Amps that must be accommodated. E.g. 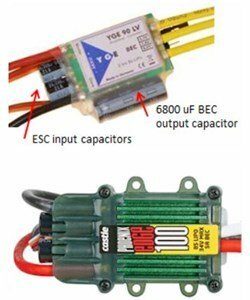 the 5 Amp Mikado BEC with 6800 uF capacitor vs the 20A Castle BEC with very little capacitance. Both capable of safely serving my 550 helicopter. If you bought the 20A BEC (with minimal capacitance) and found it to be moderately inadequate, you could replace it with a 30A BEC or you could add an adequate amount of capacitance. Either way you need to make sure that your radio/servos power supply system is adequate. More about that near the end of this article. The Ferrite choke, illustrated at the left, is designed to stop high frequency switched mode BEC noise without blocking lower frequency servo current pulses. The following examples of using a capacitor offer ways to deal with the narrow high current pulses that surge through digital servos. This servo noise is generally not a radio problem unless a transient low voltage restarts the radio. Note that radio receivers, flybarless systems, satellite antennas, digital servos all use micro controllers that are subject to restarts. In this example a large capacitor is at the side of the ESC and soldered across the 5 Amp BEC output. In most cases the high current pulses are not a problem as it is the average current that heats up wiring and connectors (a typical radio’s square pins are only good for a couple of Amps). However, the voltage drop in the wiring will be higher for high pulse currents. This is usually not a problem except for larger aircraft where larger servos draw higher peak Amps over an extended length of wire. An external 20A BEC is used to supply the necessary radio and servo current. A battery could be used instead of the external BEC. Either way, the high amperage peak currents will be traveling between the power supply and the servos. In this scenario, the BEC can deliver a more averaged current supply, thanks to the capacitor. High current pulses will travel between the capacitor, through the radio pins to each servo. It is very important to make sure the capacitance is large enough. Locating capacitors inside each servo would be an ideal but impractical solution. Y-connecting the capacitor close to the servo will keep the high current pulses away from the radio. This approach would be the most energetic for the servo, especially when long servo leads are involved. 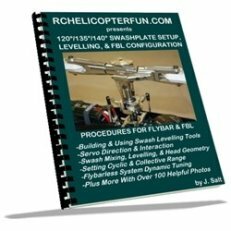 This approach is primarily recommended for large aircraft with extended servo leads. A few years ago I upgraded my T-Rex 450 from paddles to flybarless and it became necessary to install digital servos. The ESC’s embedded BEC was no longer adequate. 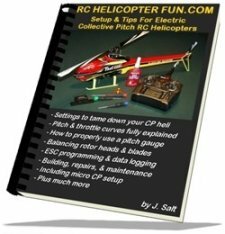 I did not want to add an external BEC to my small 450 heli. Instead, a 2000 uF capacitor did a great job of cleaning up the problem, but I encountered a couple of rare restarts. A 4700 uF capacitor has served me well for several years now. The 5 Amp BEC that came with my Mikado 550 heli kit uses a 6800 uF capacitor. The heli does use an aggressive set of Savox digital servos. When I switched to a Castle ESC with 5 Amp BEC (minimal capacitance) I plugged in a 4700 uF “Glitch Buster” which was not quite adequate (tested using a VoltMagic). 6800 uF would have done the job if I had one. Two 4700 uF capacitors solved the problem. You need to use a VoltMagic (see next section) to make sure that you have enough BEC and/or capacitance. Caution when plugging in more capacitance! When a capacitor is charging it starts out looking like a short circuit. Some BECs cannot handle much additional capacitance. Check with the manufacturer if you plan to add a large valued capacitor. Castle Creations has assured me that their BECs use current limiting protection that can handle short circuits and large capacitors. Not all digital servos and BECs are created equal. 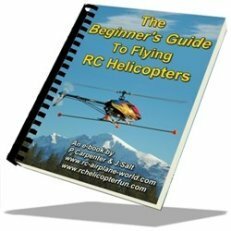 There really is no practical way to read the manufacturer’s literature and specifications in order to determine if your heli or airplane is safe. A large amperage BEC rating is no guarantee. So what can be done to make sure your flying machine is safe? Some electronics technicians and engineers have access to equipment that can see the problems caused by switched mode servos. Hardly the expensive stuff with which to stock your field box. The only practical and economical solution that I know of is to use a VoltMagic which can be used on the bench or in the air. Right out of the packaging, plugged into an empty servo slot, it is capable of alerting you to inadequately filtered power reaching your receiver. There is a red LED that will continue to blink after sampling a voltage that dropped too low. A steady red means low battery and blinking indicates a transient low was detected. Interestingly enough, stirring the sticks on the bench draws more current than the most aggressive 3D maneuvers. Plug in a VoltMagic and stir the sticks to find out if your receiver's power supply system is adequate. “One Perfect Storm” of receiver risk occurs with a switching BEC, aggressive digital servos, not enough capacitance, along with all of the servos being in sync repeatedly reversing direction. We cannot expect even high amperage BEC manufactures to provide enough capacitance for these worst case digital servo scenarios. The most cost effective way to make sure your RC receiver power supply is adequate is with a VoltMagic. David is an electrical engineer at Tektronix. There he works with oscilloscopes, spectrum analyzers, logic analyzers, video monitors and generators.